Most machines are lubricated in order to decrease the effects of friction. But in most cases, this is not sufficient and significant friction effects remain. There are four regimes of lubrication in a system with grease or oil in which the phenomena act that are mentioned in the previous section: static friction, boundary lubrication, partial fluid lubrication and full lubrication. Each of these four regimes contribute to the dynamics of the system. In the figure below, these four regimes are given in the plot of the friction force as a function of the sliding velocity, sometimes referred to as the Stribeck curve. Although in this regime of static friction there is no sliding, because of the fact that contacts between two surfaces are compliant, there are small motions when a force is applied. The contact between two surfaces can be seen as an elastic contact. The displacement is an approximately linear function of the applied force (a spring-like behavior), up to a critical force at which breakaway occurs and sliding begins. The transition from the elastic contact with pre-sliding displacement in static friction to sliding is not abrupt: first sliding starts at the boundary of a contact and then it propagates toward the center. In this regime the sliding velocity is very low and is not adequate to build a fluid film of the lubricant between the sliding surfaces. The boundary layer of the surfaces serves to provide lubrication. In most cases, the friction in this boundary lubrication regime is higher than in case of fluid lubrication, as is the situation in regimes three and four. Lubricant is brought into the load-bearing region between the sliding surfaces through motion. Some lubricant is expelled by pressure arising from the load, but as a result of the viscosity not all of the lubricant will escape and thus a thin film of lubricant is formed between the sliding surfaces. Not at all places of the contact of the surfaces this film will exist; at some places there is still solid-to-solid contact: there is partial fluid lubrication. As the velocity becomes larger, more lubricant will be brought between the surfaces and less solid-to-solid contacts will exist. This explains the descending friction force when the velocity increases, called the Stribeck effect. There is a time lag between a change in the velocity or load conditions and the change in friction to a new steady state level: the phenomenon of frictional lag takes place. This effect is a consequence of the state in the frictional contact that does not come to its new equilibrium instantly: it takes time for the lubricant to be brought or removed between the load bearing region of the sliding surfaces. In this regime the solid-to-solid contacts are all eliminated. The wear is reduced by orders of magnitude. The viscosity of the lubricant is determinative for the friction force and the friction phenomenon now at work is the well-behaved viscous friction, besides the Coulomb friction. 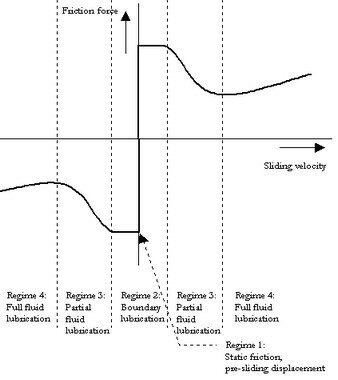 The four dynamic regimes of friction in the plot of friction force as a function of sliding velocity. Dry friction is friction between two bodies in absence of contaminations of the contact surfaces. This is an ideal situation which is not possible to achieve in real systems, due to the fact that chemical reactions will occur at the surfaces. Therefore dry friction will show some of the effects described above. Some special effects due to the use of lubricants, such as the Stribeck effect and sometimes viscous friction will not be significant in dry friction.